The year 2017 marks the 150th anniversary year of Confederation. This milestone coincides with the 30th anniversary of the first investiture of the Order of Ontario. 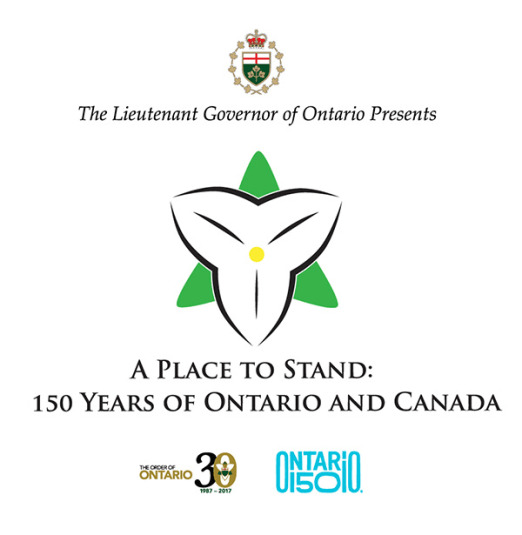 On the evening of June 28, at Roy Thomson Hall in Toronto, the Lieutenant Governor of Ontario presents A Place to Stand: A Celebration of 150 Years of Ontario and Canada. Historian Hugh Brewster and actress Cynthia Dale narrate this tribute to Canada in words and images with music conducted by Noel Edison. The event brings together the artistic talent of many great Canadians, including The Tenors, Jackie Richardson, Murray McLauchlan, Richard Margison, Chris Hadfield, Margo Timmins, Miss Conception, Barbara Croall with Highlands Opera Studio, the Elora Festival Singers, the Toronto Mendelssohn Choir, and the Canadian Children’s Opera Company. This event runs approximately two hours with an intermission. Tickets are invalid after 7:00pm. You must have entered the venue before 7:00pm. If you have not arrived your tickets will be given to the rush ticket line. There is a strict 2 ticket limit for this event. All over the limit orders will be returned without notice. Tickets will be sent as of June 14th, 2017. Doors open at 6pm for guests to view Ontario 150 Signature Initiatives displays in the Rotunda.